Trouble inside the Big Brother Naija house after Teddy A and Alex steal and eat Bambam's meat. Meat is no joking matter in the Double Wahala House, and Teddy A and Alex are the last Housemates to have felt the heat of the meat. 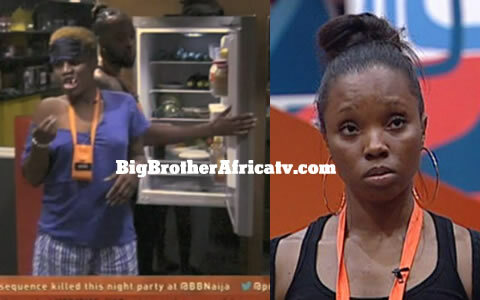 Over dinner, Bambam had asked Nina to save her share of meat as she felt satisfied and had eaten enough. Nina and Bambam have gotten closer lately and so Nina agreed to store her pal’s dish in the fridge, for Bambam to have it whenever she would be ready. Upon awakening, Bambam opened the fridge and to her greatest surprise her meat had vanished. Puzzled, she enquired who in the House could have eaten it and had not had the courtesy to inform her. A mini investigation ensued, as Rico started recounting the previous day’s events and speculating as to the meat’s whereabouts. While having their weekly hairdressing session, Alex, Teddy A and Cee-C also joined efforts to try and piece together what appeared to be an enigma. It turned out that it was Teddy A who out of self-indulgence devoured the leftover, and because Alex had seen him reluctantly co-opted her in his secret by sharing a little with her. Out of embarrassment, and because it tasted so good, both vowed to never confess their gluttony to the House. Earlier Teddy A had thoroughly scorned Bambam for eating his meat, yet he did the same and even pulling Alex down with him. A few days later, it is the same Teddy A who during a Diary Session, vowed to give up all his meat for the chance to stay in the House longer. Still Teddy A’s love of meat is definitely a key feature of this House. Remember when Head of House Miracle had Nina guard his meat jealously?